Europeans are generally not big on tipping. This includes Italy, where restaurants often already include gratuity in their diners’ final bill. The reason behind this apparent cultural aversion to tipping is the idea of a power mechanism between the giver and the receiver of the tip. However, in tourist-heavy places in the country, service workers are beginning to get used to excessive tipping by tourists, especially Americans. Nevertheless, it is still better to go by tradition. You do not need to tip each time in Italy. To set some perspective, take note that two-thirds of Italians do not tip at restaurants. They know that servers and other service workers are already paid a decent wage and hence do not rely on tips as much as their foreign counterparts do. 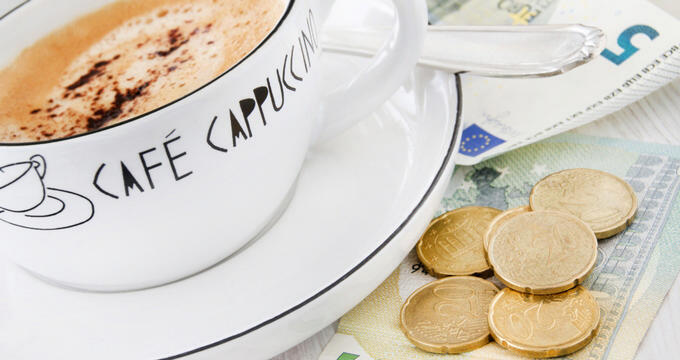 If you are happy with the quality of your drink at a cafe, it is okay to round up your bill and leave the change. You can tip bartenders by rounding up the amount of each drink to the nearest euro and letting them keep the change. Taxi or cab drivers do not expect tips but appreciate them. In general, passengers can round up their fare to the nearest euro if it’s a short trip or to the nearest 10 euros if it’s a long ride. Airport shuttle drivers are typically not tipped. However, feel free to give a little extra if they help you with your bags. An acceptable amount is 1 euro per bag. When your fare is fixed or pre-paid, you do not need to add a tip. In hotels in Italy, you can leave 50 cents to 1.50 euros per day for housekeeping staff. However, again, this depends on the quality of their service. You do not have to leave a tip if you are not satisfied with the cleanliness of your room. Doormen are commonly just given simple thanks. But if they hail you a cab or help you bring in your bags, you may give a tip of 1 euro. Do add more if they help you with several heavy bags. Bellhops are typically given 1 or 2 euros per bag as tip. However, do not exceed 5 euros as this is simply unheard of. You may tip the concierge 1 or 2 euros if they do something that particularly stands out, like securing hard-to-get reservations or concert tickets. Other times, they are rarely ever tipped. Tour guides in Italy are paid well and hence do not depend on tips or rely on them. However, they know that tips mean customer satisfaction, especially when coming from North American customers, and thus appreciate them also. In salons, hairstylists, hairdressers, and other staff are not typically tipped. When in doubt, round up your bill to the nearest 10 euros. Service providers in spas are also generally not tipped, and they do not expect it. However, if you feel compelled to tip for great service, add 10% to your final bill. Never tip proprietors. While it is true that Italians have somehow gotten used to the foreign way of tipping (excessively), it can still be insulting for a business owner to be given a tip. Their job is running their business, and tipping them sends the message that you think their business is not doing well enough. That said; when you are in a small B&B or any mom-and-pop place, make sure you are not unknowingly offering a tip to the owner. They usually run their business and serve their customers themselves and might be mistaken for employees. Some seasoned travelers would advise that you give no less than 5 euros, the smallest euro bill. However, this is usually done only when, for example, a porter carries your entire luggage up five flights of stairs due to elevator breakdown. By contrast, in normal situations, we suggest you stick to the smallest amounts mentioned here. In summary, tipping is generally neither done nor expected in Italy. However, there are still times and places where the service workers expect gratuities. Review this guide, or play it by ear or ask when uncertain. Just remember to always tip in cash in the local currency to make sure that your server does receive your tip and does not need to pay charges for currency conversion.